(CNN) - The following contains spoilers about the "Game of Thrones" Season 8 premiere. The penultimate season of "Game of Thrones" was largely defined by bringing key characters together -- some meeting for the first time, others reunited after having endured harrowing ordeals. The Season 8 kickoff ratcheted up that dynamic in thrilling fashion, as forces marshal for the anticipated battle between the living and the undead legions of the Night King. Of course, forging those alliances won't come easily, with plenty of suspicion and mistrust sprinkled throughout the hour. But the mantra, repeated by different characters in various ways, was as Tyrian (Peter Dinklage) put it, "We must fight together now, or die." Similarly, Jon Snow (Kit Harington) sought to defend Daenerys Targaryen (Emilia Clarke) from his wary countrymen in the north, saying that in the battle to come, "Without her, we don't stand a chance." 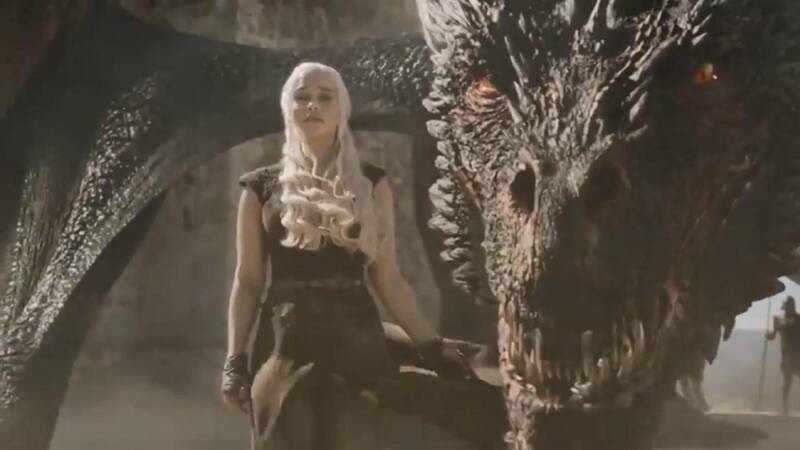 Despite the pair's way-cute date riding dragons together, the premiere rather boldly made Snow aware of the program's biggest reveal -- namely, that he has a legitimate claim to becoming king of Westeros, a revelation that throws his allegiance to the more ruthless Daenerys into doubt, and that could have major ramifications for who winds up on the Iron Throne. The one character going against the come-together grain, meanwhile, remains Cersei (Lena Headey, at her imperious best), who doesn't seem to mind seeing much of the world burn as long as she winds up surviving. One of the complaints about the last season was that it moved too fast, that characters managed to traverse the distance between locales in record time. While that feels like nitpicking (hey, it's what die-hards do), the show has stepped up its pacing. For the most part, that has been immensely satisfying, yielding crowd-pleasing moments that the and that the series generally avoided in the often-grim journey, especially for the Stark kids, which has led to this point. In the premiere, that included fine scenes for the battle-hardened Arya (Maisie Williams), Sansa (Sophie Turner) and Theon (Alfie Allen), as well as the stunning if awkward meeting of Jaime Lannister (Nikolaj Coster-Waldau) and Bran Stark (Isaac Hempstead Wright). That last scene, which tantalizingly capped off the episode, dates back to what is essentially the program's original sin. Caught in a compromising moment, Jaime threw Bran off a castle wall, crippling the boy, whose eerie mental powers are only one of the supernatural elements that have gradually permeated the series. Having moved ahead of author George R.R. Martin's literary output, TV producers David Benioff and Dan Weiss have piloted the story to its finish, which represents its own significant accomplishment. Novelists don't have to worry about holding massive casts together, kids growing older or actors chafing to move on to different roles. For all that happened in the opener -- and a lot did -- there was still a sense that this episode basically set up the pieces, artfully, for what's to come, with the combination of character beats and epic sweep that viewers have come to expect from the series. "Thrones" is an unwieldy beast, and it's still possible that the show won't be able to stick the landing. But if the premiere is any guide, like Jon and Daenerys' dizzying date, the remaining five episodes promise to be a genuinely wild ride.